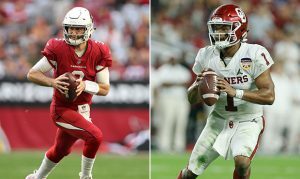 Thursday night's first round of the 2019 NFL Draft promises to deliver pure drama as the Cardinals will be deciding whom its franchise quarterback will be. 98.7 FM roundtable: What should the Cardinals do at No. 1 in the NFL Draft? The Arizona Diamondbacks beat the Pittsburgh Pirates Wednesday on Merrill Kelly's 7 innings pitched and Ketel Marte's two home runs. Leave it to the exit interview right before Brooklyn Nets point guard D'Angelo Russell enters restricted free agency as the moment he finds out about another team he's being linked to. MLB.com's Richard Justice included the D-backs' Yoan Lopez and Christian Walker in his eight under-the-radar rookies that have caught his attention. With just over 24 hours to go until the 2019 NFL Draft, the consensus from Las Vegas is the Cardinals are taking Kyler Murray No. 1 overall. Evidence presented in the college basketball corruption trial included a recording of defendant Christian Dawkins claiming that he and Arizona head coach Sean Miller discussed payments to Deandre Ayton. On Tuesday, former Suns general manager Ryan McDonough expressed his thoughts about the Suns recent decision to fire head coach Igor Kokoskov. Suns GM James Jones spoke Wednesday, two days after firing Igor Kokoskov. His words reflected an organization that is constantly shuffling direction. Coyotes captain Oliver Ekman-Larsson was named a finalist for the King Clancy Memorial Trophy for off-the-ice leadership and humanitarian contribution. Portland Trail Blazers assistants David Vanterpool and Nate Tibbetts have been linked to the Cleveland Cavaliers and Phoenix Suns head coaching vacancies. Paul George: Damian Lillard's 37-foot game-winner was a 'bad shot.' Narrator: It wasn't. The Arizona Cardinals are a team with a lot of needs. Which one will they fill with their first-round selection in the 2019 NFL Draft? Luke Weaver (2-1) struck out seven and won his second straight start for the Arizona Diamondbacks in a 2-1 victory over the Pittsburgh Pirates. Phoenix Rising FC forward Junior Flemmings was named to USL Championship's Week 7 Team of the Week while teammate Jason Johnson was an honorable mention. The Phoenix Suns dismissed head coach Igor Kokoskov on Monday night following a 19-63 season, and on Tuesday, the rest of the coaching staff was let go. Kliff Kingsbury didn't feel concerned about the absence of Cardinals cornerback Patrick Peterson from voluntary mini-camp. Will the Cardinals use the full 10 minutes to make their pick?